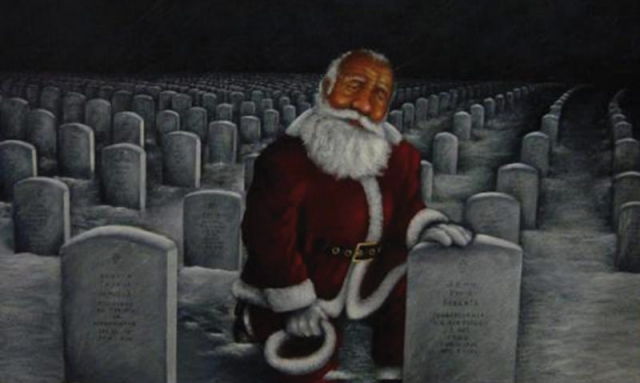 About six years ago Thomas Shively, a U.S. Air Force veteran and a retired computer programmer and artist, painted an image of Santa Claus kneeling beside headstones of those who gave all for their country. “It was, and is, my hope that those who see this painting think and give pause during their holiday celebrations to remember our fallen brothers and sisters, as well as all their extended family and the loss they have suffered. And those who can no longer find the joy to celebrate,” said Shively, a member of South Mountain American Legion Post 674 in Holly Springs, Pa.
Shively is one of five sons to have served in the military from the 1940s through the 1970s. “I can’t imagine the apprehension my mother must have felt as each one of my brothers and I, in turn, came home from the recruiter’s office to tell her that we had enlisted to serve,” Shively said. “We know she was always proud and never would a week go by that a letter from home wouldn’t arrive. But can you imagine the wait for her to hear from one of us? Share your stories of remembrance on the Legion’s web page www.legiontown.org.